With the popularity of ornamental grasses, new cultivars are being introduced every year. Finding one to suit your soil and climate conditions as well as visual preference should not be difficult. Blue Fescue: Festuca glauca This hardy perennial grass has been used for some time in gardens across the country. It is a cool season grass, evergreen in zone 5, hardy to zone 4, with some varieties hardy in zone 3. It is low growing, 6-10”, and very nicely mounded. 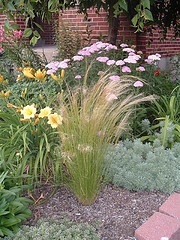 Blue Fescue works nicely for containers, border edging, or in masses. 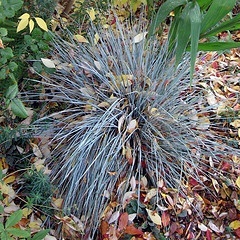 Blue Fescue prefers sun to part shade and dry sandy soil. However does like supplemental water in dry spells. Does not like heavy wet soil. Blue Oat Grass: Helictotrichon sempervirens Somewhat similar to Blue Fescue, Oat Grass is also a cool season grass, growing in upright clumps. It prefers sun to light shade and average to dry soil. Single sided seed heads develop in June, starting out white then turning golden. Evergreen in zone 5, hardy to zone 3 or 4. Also hardy up to 9,000 feet. Feather Reed Grass: Calamagrostis x acutiflora This hardy perennial grass is cool season grass that is hardy to zone 4, where it becomes a warm season grass due to the cooler overall climate of the north. It has an upright narrow form and arching fronds, growing from 2 to 5 feet depending on variety. The flower spikes generally persist into winter. Feather Reed prefers medium to moist conditions and will tolerate heavy soils. The‘Karl Foerster’ variety blooms earlier than most Feather Reed and works well where the growing season is short. Reaches about 4 to 5 feet in height and is hardy to zone 3. ‘Overdam’ has white variegated foliage and is best in light shade. It reaches 2 to 3 feet and is hardy to zone 4. ‘Avalanche’ is variegated, and ‘Eldorado’ has narrow green leaves that have bright gold centers. Fountaingrass (perennial): Pennisetum alpecuroides Fountaingrass has been widely used by gardeners for some time. It is a warm season grass, that will do well in moderately moist to moist soil with full sun. It has been found to be hardy to zone 4, but general recommendation is zone 5. Winter protection is advised in case of severe cold in zone 4. Fountaingrass grows to a height of 3 or 4 feet Foliage is bright green and displays bottlebrush flowers. Excellent specimen plant or in containers. Hakone Grass: Hakonechloa macra ‘Aureola’ A good choice for shady areas, Hakone is a hardy warm season perennial grass, to zone 4. There is a difference of opinion about whether Hakone Grass is hardy in zone 4, but this photo is from a zone 4 trial garden and it certainly looks healthy after a tough winter. Low growing at 12-20 inches, it functions well as a groundcover or in containers. It is slow growing with bright yellow foliage. Performs well in light to heavy shade in moist acidic soil. ‘Aureola’ has a cascading form supplying movement to the garden and a soft appearance. Bright variegated leaves brighten the darker corners of a shaded area. Japanese Silvergrass: Miscanthus sinensis This particular variety of the hardy perennial, warm season grass, is 4-8 feet tall and hardy to zone 3. It’s upright stature is excellent for screening, specimen plants, large container plantings, or water features. It does very well in full sun and average to wet soils. Miscanthus covers a large variety of grasses, and it is important that you select a reliably hardy type. ‘Silberfeder’ has wonder full plumes in fall and gets through a zone 4 winter well. It is vase shaped with silver mid rib foliage. ‘Strictus’ is hardy only to zone 5, perhaps marginally in zone 4, and grows well in full sun to part shade. Also known as porcupine grass, it has stiff leaves with yellow bands. It is very eyecatching and brightens a dark corner or complements darker plants. 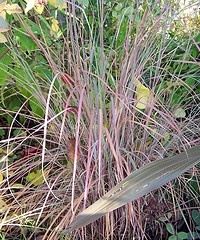 Some Silvergrass can be invasive and should only be grown in cultivated and tended areas rather than near natural habitats such as prairie or woodland, where it can invade unchecked. Japanese Blood Grass: Imperata Japanese Blood Grass is a wonderful red tipped ornamental grass that develops increasingly redder as it matures each season. By autumn it is blood red. If any blades revert to green they should be removed to preserve the overall red color. It requires very little but sun to part shade with moist well drained soil. Granular fertilizer may be applied around the base of the plant about every 6 weeks, do not allow the granules to contact the foliage. Remove the foliage after the first freeze. Some of the Blood Grass spreads very aggressively, ‘Rubra’ and ‘Red Baron’ are much more controlled. Divide in spring to propagate more plants and to control size. Hardy in zones 5-9. Imperata cylindrica ‘Red Baron’ is hardy to zone 4 and is pictured here. Reaching 12-18” tall and spreading 24-35” wide, the bright green blades have red tips. Compact enough to use in small spaces or for accents. June Grass: Koeleria macrantha June Grass is a hardy perennial to zone 3 and is tough enough to take some foot traffic. It is a small cool season grass growing to 12-18” high and is great for tough sights. It has a tight growth habit making it good for borders, along paths in both sun or shade. Showy white flower panicles appear in June, followed by straw colored seed heads. June Grass is a host for butterfly larvae. It prefers average to dry soil, and is also hardy to 11,000 feet. Lemon Grass: Cymbopogon citratus Lemon Grass is a beautiful annual grass grown not only for its’ accent qualities, but for its’ citrus aroma and as a cooking herb. It is a bright mounded plant growing about 2 feet high. Grow it in pots and bring it indoors at the first sign of frost. Little Blue Stem: Schizachyrium scoparium Little Blue Stem is a warm season grass that grows best in dry conditions. It is a hardy perennial to zone 4, but found to be hardy in zone 3. Clumps are green to blue-green with fluffy white seed plumes. Fall color is orange to red. Little Blue Stem does best grown in clay soil that is not wet, and tolerates light shade and drought. The University of Minnesota released a new ‘Blue Heaven’ in 2011 that should also be hardy to zone 3. Foliage is bluish with burgundy tones, and silvery white seed heads for wonderful fall color. Pampas Grass: Cortaderia selloana ‘Pumila’ is a dwarf Pampas Grass. Pampas is an annual warm season grass, this dwarf variety growing to about 3 feet. ‘Pumila’ is more cold hardy than tender pampas grass and may be semi perennial once established up to zone 5, hardy to zone 6. Pampas is commonly grown for it’s showy fluffy white flower heads. Pennsylvania Sedge: Carex pennsylvanica Sedge is a low growing ground cover, cool season hardy perennial grass. They generally reach about 6-12” high and are fine textured and nicely mounded. They will do well in sun or shade in average and dry soil. Sedge grass is hardy to zone 3. There are varieties that will do well in more shade, some do well in very compacted soils, more diversity every year. Blue sedge, ‘Carex flacca’, does well in some shade and is very hardy. Prairie Dropseed: Sporobolus heterolepis Prairie Dropseed is a hardy perennial grass that is interesting throughout the growing season. It has emerald green foliage with fine textured seed heads and is gold to orang-red in fall. It is a very long living native plant with a graceful arching form of thin delicate leaves. A warm season plant, it prefers full sun and average to dry soils and is hardy to zone 3. Growing to 2 or 3 feet it is excellent for small spaces. Purple Moorgrass: Molina caerulea A hardy perennial grass with attractive clumps of light green upright arching flower stems. Foliage turns yellow in fall and brown, yellow or purple flowers fade to tan. Purple Moorgrass is a cool to warm season grass hardy to zone 3 or 4 that self seeds. Generally midsize to tall, 5 to 7 feet. Prefers full sun and average to wet soil and does not like high alkaline soil. Mature leaves and flowers break off at the base reducing winter interest. ‘Skyracer’ has tall spires of airy heads that work well to anchor tall structures or as a finishing point of a garden. ‘Heidebraut’ is more compact at 4 feet, and ‘Moorhexe’ is compact with purple flowers. Silver Spikegrass: Spodiopogon sibiricus A warm season grass that does well in a variety of soils and is hardy to zone 3. Silver spikegrass has a shrublike upright form that has bold dark green foliage, turning yellow orange or red in fall. It serves well as screening or a hedge and is a long term performer. It grows up to 4 feet with fine flower heads a foot above the foliage. It prefers full sun but will do fine in light shade, and average to moist soils. Switchgrass: Panicum virgatum This hardy perennial grass prefers full sun and moderate to moist soil. It is a warm season grass. Switchgrass grows to 3 to 6 feet tall with stiff upright clumps and showy, airy flowers of pink, red or silver in midsummer. Will tolerate soil quality extremes. Hardiness varies by variety from zones 3 to 4b. Switchgrass attracts birds and does reseed. Use for screening, water gardens or prairie gardens. ‘Heavy Metal’ has been prone to rust, but ‘Northwind’ is an improved variety. It has wide bluish foliage and upright habit that can make an excellent focal point in a garden or landscape. ‘Dewey Blue’ is generally found in dry sandy coastal areas of the east and southeast, but is very hardy and does well in the midwest and even north, found to be hardy to zone 4. It grows to 4 feet tall with a graceful habit and blue foliage. Airy panicles of tan flowers appear in late summer, with seed heads that hang on through winter. Tufted Hairgrass: Deschampsia caespitosa A cool season grass preferring moderate to moist soil but does not like clay, it is hardy to zone 3. Tufted hairgrass will need some supplemental watering. Dark green tufted foliage has airy flower panicles that change from green to yellow then nearly purple. Grows to 3 or 4 feet in full sun or light shade. ‘Northern Lights’ has cream, gold and pink vareigation and does not bloom. Also hardy to 12,000 feet. The possibilities for use are endless, have some fun with grass!